Did you know that you have a voter scorecard? The scorecard doesn’t tell how you voted. That is confidential. It does report if you voted or didn’t vote. You get a higher score if you vote in both primary and general election. Why does this matter to recreational therapists? Sometimes legislation is introduced that impacts recreational therapists, like H.R.626 — 115th Congress (2017-2018). R. 626: This bill amends title XVIII (Medicare) of the Social Security Act to require the Centers for Medicare & Medicaid Services, for purposes of determining whether inpatient rehabilitation-facility services are reasonable and necessary under Medicare, to include recreational-therapy services among the therapeutic modalities that constitute an intensive rehabilitation-therapy program. 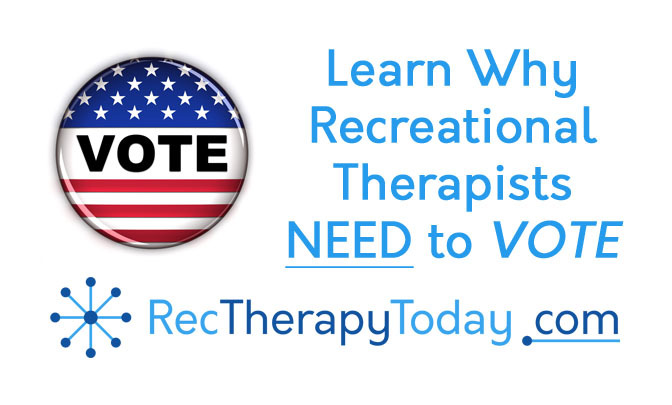 Recreational therapists will want to reach out to their Representatives. Let’s imagine if Billy Bob Joe Penny is a recreational therapist at The Long Sunset. Billy Bob doesn’t vote. Billy Bob goes to U.S. Congresswoman Jane Doe from the state of (fictional state) of Timbuktu. Congresswoman Jane Doe has her staff to check up on Billy Bob’s score and discover he has a (0) voting record. In fact, Billy Bob isn’t even a registered voter. Congresswoman Jane Doe serves all of the people form the (fictional state) of Timbuktu. Congresswoman Jane Doe probably wants to win the next election too. How likely is this Congresswoman to co-sponsor legislation when a person who isn’t registered to vote and doesn’t vote asks her to do so? My advice: I’m not here to tell you who to vote for. That is none of my business. I’m not here to impose my political view on you. That is private. I am involved in public policy regarding legislation pertaining to recreational therapy and for people with disabilities and mental health needs.